The Banner Trophy was donated by Mr George Banner, once Tower Captain at Alderton, and he can be found on an old peal board there. The G&B were bequested some money on his death, which was used to pay for one of the two new trebles at Gloucester Cathedral and the trophy shown here. The Trophy is awarded to the best team in the Branch 6-bell competition, who then goes forward to represent the Branch in the Association Croome Trophy. The Cleeve Trophy, which was introduced in 2002, was donated by Janet Covey-Crump (née Cleeve) as an award for the best novice band. 'Novice' is presently defined as 'no more than two G&B proficiency certificates within the band'. Branch Competition Rules (in a printable format). The test piece will be 120 changes (not 240) of any Doubles or Minor method. Each team shall have 5 minutes to adjust ropes and practise as they wish. The signal to start will be two whole pulls on the treble. Marking will start at the first blow of the method or the first Call Change, or after one minute of rounds if the opening rounds exceed one minute. The closing rounds will be marked in full. Judging will be entirely on the standard of striking. One Ringing Master shall be in charge of the competition. Plain courses or Call Changes to a minimum of 120 are allowed subject to the agreement of the Ringing Master in charge (see FAQs). The Steward and Ringing Master in charge shall be allowed to participate in the competition. When many bands are expected to enter, we may choose to have more than one draw so that people do not have to wait while all competitors ring. This should also enable us to allow for individual towers that have additional ringing commitments, e.g. weddings, if we are warned in advance. Towers may enter more than one band of regular Sunday Service ringers. One reserve ringer with a regular association with the tower may be included to make up one of the bands with the consent of the Ringing Master in charge. Towers wishing to include members but not having enough ringers to make up another bona fide band should ask the Ringing Master in charge to organise a suitable scratch band. It would be helpful to have an indication of names in advance. All bands will compete for the Banner Trophy. Bands with only two ringers with proficiency certificates can also compete for the Cleeve Trophy (see FAQs). We hope branch members will enter into the spirit of the competition when interpreting the above rules. For guidance we have provided answers to some frequently asked questions below. Q: What's the point of having a striking competition? A: To promote better striking for Sunday Service ringing. Q: What is the definition of a Sunday Service ringer? A: Someone who frequently and regularly rings for Sunday Service at your tower. Q: Does my band meet the criteria? A: Yes if no other band would complain about it if you won. Q: What Call Changes shall we ring? A: It is suggested that the conductor calls the bells at least into a recognised change, e.g. Queens or Tittums, and back. Q: What happens if my tower has 6 'proficient' ringers and 4 novices, do I have to choose between entering a band that qualifies for the Cleeve, and putting in my best band for the Banner? A: With the consent of the Ringing Master in charge you may reuse 2 ringers to make up a band for the Cleeve Trophy. Q: What are the duties of the Steward? Point out which bell is the treble. Warn you when your 5 minutes practice time is nearly up. Advise call change bands when they've rung 4 minutes of changes (approximately 120 changes). Q: What can I do if my question has not been answered? A: Contact one of the branch Ringing Masters whose names will be in the annual report and on the branch programme . 2013 Charlton Kings No eligible team completed the test piece. 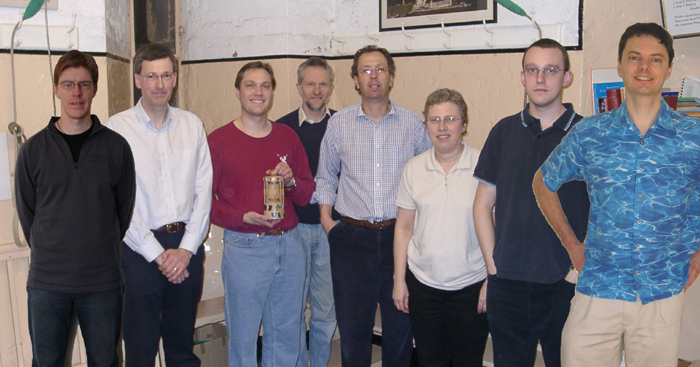 ** Subsequently won the Croome Trophy, Association 6 bell competition. For a complete set of rules for the Association competitions please see the Association Annual report. Association 8-bell striking competition. Each branch shall select a representative band containing not more than five ringers from any one tower. Conrad Warford, Stuart Tomlinson, Philip Abbey, John Ridley, Richard Knight, Hilda Ridley, Simon Ridley & Mark Davies. Each branch holds a local competition to select a tower to represent it in the Association 6-bell competition. At least five of the band must be regular Sunday service ringers of the tower they represent. The sixth must have a genuine and regular association with the tower. This is the first time the Cheltenham Branch has won the Croome Trophy. The Young Person's Striking Competition was started in 2004. Established to encourage and improve belfry maintenance. Rules and entry form for 2006. This competition is now suspended by resolution of the AGM 2010. Cheltenham, St. Mark's - Highly Commended. Awarded the Ringing Master's Baldrick (right) due to the amount of effort put in by the local band this past year towards achieving what they wanted from the restoration. Cheltenham, St. Mark's - Highly Commended. Award for improvement in the face of severe adversity!